The Guardian is a British newspaper owned by the Guardian Media Group. It is published Monday to Saturday in the Berliner format, and is the only British national newspaper to publish in full color. The Guardian generally takes a liberal to left-wing position, and is known for its non-conformist opinions and support of innovative, non-traditional approaches. Together with The Times and The Daily Telegraph it is considered one of the "big three" British quality newspapers. Until 1959 it was called The Manchester Guardian, reflecting its provincial origins. The paper is still occasionally referred to by this name, especially in North America (to distinguish it from other newspapers with similar names), although it has been based in London since 1964 (with printing facilities in both Manchester and London). The Guardian seems to have solidified its place as one of the premier papers in England for the future, and is representative of the strength of British media around the world. If it is able to live up to its founding vision, implementing it with high presentation standards, the newspaper offers substantial support to the improvement of society. The Manchester Guardian was founded in Manchester, England in 1821 by a group of non-conformist businessmen headed by John Edward Taylor. The prospectus which announced publication of the new newspaper proclaimed that "it will zealously enforce the principles of civil and religious Liberty … it will warmly advocate the cause of Reform; it will Endeavour to assist in the diffusion of just principles of Political Economy; and to support, without reference to the party from which they emanate, all serviceable measures." Its most famous editor, C. P. Scott, made The Manchester Guardian into a nationally famous newspaper. He was editor for 57 years from 1872, and became its owner when he bought the paper from the estate of Taylor's son in 1907. Under Scott, the paper's moderate editorial line became more radical, supporting Gladstone when the Liberals split in 1886, and opposing the Second Boer War against popular opinion. Scott's friendship with Chaim Weizmann played a role in the Balfour Declaration, and in 1948 the Guardian was a supporter of the State of Israel. The story of the relationship between The Guardian and the zionist movement and Israel is told in Daphna Baram's book Disenchantment: The Guardian and Israel. In June 1936, ownership of the paper was transferred to the Scott Trust (named after the last owner, John Russell Scott, who was the first chairman of the trust). This move ensured the paper's independence, and it was then noted for its eccentric style, its moralizing, and its detached attitude to its finances. The first edition was published on May 5, 1821, at which time The Manchester Guardian was a weekly, published on Saturdays and costing seven pennies; taxes on newspapers made it uneconomical to publish more frequently. When the tax was reduced in 1836 The Guardian added a Wednesday edition; with the abolition of the tax in 1855 it became a daily paper. In 1952, the paper took the step of printing news on the front page, replacing the advertising that had hitherto filled that space. The editor, A.P. Wadsworth, wrote, "it is not a thing I like myself, but it seems to be accepted by all the newspaper pundits that it is preferable to be in fashion." In 1959 the paper dropped "Manchester" from its title, becoming simply The Guardian, and in 1964 it moved to London, losing some of its regional agenda but continuing to be heavily subsidized by sales of the less intellectual but much more profitable Manchester Evening News. The financial position remained extremely poor into the 1970s; at one time it was in merger talks with The Times. The paper consolidated its left-wing stance during the 1970s and 1980s but was both shocked and revitalized by the launch of The Independent in 1986 which competed for a similar readership and provoked the entire broadsheet industry into a fight for circulation. In 1988, The Guardian had a significant redesign; as well as improving the quality of its printers ink, it also changed its masthead to its soon-familiar (but no-longer used as of 2005) juxtaposition of an italic "The" with a bold "Guardian." In 1992, it relaunched its features section as G2, a tabloid-format supplement. This innovation was widely copied by the other "quality" broadsheets, and ultimately led to the rise of "compact" papers and The Guardian's move to the Berliner format. In 1993, the paper declined to participate in the broadsheet "price war" started by Rupert Murdoch's The Times. In June 1993, The Guardian bought The Observer, thus gaining a serious Sunday newspaper partner with similar political views. Its international weekly edition is entitled The Guardian Weekly, though it retained the title Manchester Guardian Weekly for some years after the home edition had moved to London. It includes sections from a number of other internationally significant newspapers of a somewhat left-of-center inclination, including Le Monde. 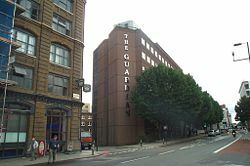 In 2004, The Guardian introduced an online digital version of its print edition, allowing readers to download pages from the last 14 issues. In September 2005, The Guardian moved to the Berliner paper format and changed the design of its masthead. 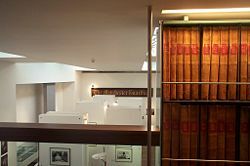 The Guardian is the only British national newspaper to publish in full color (although the edition for Northern Ireland still has much black-and-white content). It was also the first newspaper in the UK to be printed in the Berliner size. In November 2005, The Guardian had a certified average daily circulation of 378,618 copies, as compared to sales of 904,955 for The Daily Telegraph, 692,581 for The Times, and 261,193 for The Independent. Editorial articles in The Guardian are generally in sympathy with the liberal to left-wing positions in the political spectrum. This is reflected in the paper's readership: a poll taken between April-June 2000 showed that 80 percent of Guardian readers were Labour Party voters. According to another poll taken in 2004, 44 percent of Guardian readers vote Labour and 37 percent vote Liberal Democrat. Traditionally affiliated with the centrist Liberal Party, and with a northern circulation base, the paper earned a national reputation and the respect of the left during the Spanish Civil War, when along with the Liberal News Chronicle, the Labour Daily Herald, the Communist Daily Worker, and several Sunday and weekly papers it supported the republicans against the insurgent nationalists led by General Francisco Franco. During the war in Afghanistan and 2003 invasion of Iraq, The Guardian attracted a significant proportion of anti-war readers as one of the mass media outlets most critical of UK and USA military initiatives. In August 2004, for the US presidential election, the daily G2 supplement, edited by Ian Katz, launched an experimental letter-writing campaign in Clark County, Ohio, a small county in a swing state. Katz bought a voter list from the county for $25 and asked people to write to those on the list undecided in the election. It was left to readers to decide in what way they should seek to influence these voters' preferences, but it was acknowledged that most Guardian readers would probably back John Kerry over George Bush. There was something of a backlash to this campaign, and on October 21, 2004, the paper retired it. In October 2004, The Guardian published a humor column by Charlie Brooker in its entertainment guide, which appeared to call for the assassination of US President George W. Bush. This caused some controversy and the paper was forced to issue an apology and remove the article from its website. The paper is sometimes referred to as The Grauniad, a name which originated with the satirical magazine Private Eye. This came about because of The Guardian's reputation for text mangling, technical typesetting failures, and typographical errors. There were even a number of errors in the first issue, perhaps the most notable being a notification that there would soon be some goods sold at "atction" instead of "auction." Hence the popular myth that the paper once misspelled its own name on the page one masthead as "The Gaurdian." Although such errors are now less frequent than they used to be, the "corrections and clarifications" column can still often provide amusement. Until the founding of The Independent, The Guardian was the only serious national daily newspaper in Britain that was not clearly conservative in its political affiliation. The term "Guardian reader" is therefore often used pejoratively by those who do not agree with the paper or self-deprecatingly by those who do. Does my right hon. Friend find it bizarre—as I do—that the yoghurt- and muesli-eating, Guardian-reading fraternity are only too happy to protect the human rights of people engaged in terrorist acts, but never once do they talk about the human rights of those who are affected by them? Even doctors have perpetuated it by using the acronym GROLIES (Guardian Reader Of Low Intelligence in Ethnic Skirt) on patient notes. The Guardian's science coverage is now extensive and although its Weekend supplement features a column by Emma Mitchell, a natural health therapist, and G2 was until the relaunch home to Edzard Ernst's weekly column on complementary medicine, the paper now carries the Bad Science column by Ben Goldacre and a quizzical column in G2 called The Sceptic, which looks at the evidence for popular treatments and remedies. Also, as alternative and complementary medicine have become more widely accepted most of the quality dailies now feature at least one column or writer devoted to the subject. The Guardian, along with other British news outlets, has a tradition of spoof articles on April Fool's Day, sometimes contributed by regular advertisers such as BMW. The most elaborate of these was a travel supplement on "San Serriffe," a fictional island nation created for April Fool's Day. An elaborate description of the nation, using puns and plays on words relating to typography (such as "sans serif"), was reported as straight news, apparently fooling many readers who did not understand the joke. The Guardian is the sponsor of two major literary awards: The Guardian First Book Award, established in 1999 as a successor to the Guardian Fiction Award which had run since 1965, and the Guardian Children's Fiction Prize, founded in 1967. In recent years it has also sponsored the Hay Festival in Hay-on-Wye. In addition, the annual Guardian Student Media Awards, founded 1999, recognize excellence in journalism and design of British university and college student newspapers, magazines and internet websites. ↑ Founding of the Manchester Guardian. Retrieved January 17, 2007. ↑ Spartacus Educational. Manchester Guardian. Retrieved June 11, 2007. ↑ "More black and white than colour for Ireland." Village. Retrieved June 11, 2007. ↑ Audit Bureau of Circulations Ltd.
↑ MORI. 2005. "Voting Intention" in Newspaper Readership. Retrieved June 11, 2007. ↑ 2004. "My fellow non-Americans..." in The Guardian. Retrieved June 11, 2007. ↑ Goodenough, Patrick. 2004. "Left-Wing UK Paper Pulls Bush Assassination Column." CyberCast News Service. Retrieved June 11, 2007. ↑ Brooker, Charlie. 2004. "Screen Burn, The Guide" in The Guardian. Retrieved January 17, 2007. ↑ Hansard 374:54 2001-11-19 Labour Member of Parliament Kevin Hughes's largely rhetorical question in the House of Commons on November 19, 2001. Retrieved June 11, 2007. ↑ “Doctor slang is a dying art.” BBC News (August 18, 2003). Retrieved January 17, 2007. ↑ Boseley, Sarah. 2003. "The alternative professor." The Guardian. Retrieved June 11, 2007. ↑ Burch, Druin. The Sceptic. Retrieved June 11, 2007. All links retrieved January 21, 2014. This page was last modified on 21 January 2014, at 19:55.